Great design is when there's nothing left to take away. Ara is a chair of refined performance, comfort and support that redefines our perspective on sustainability. 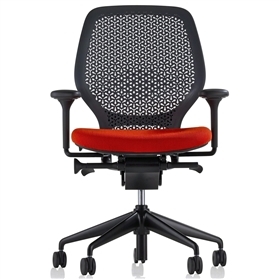 Ara is the first task chair developed and manufactured in Europe to achieve Cradle to Cradle accreditation. Ara's character and performance are defined by the design of the chair's adaptive elastomer membrane. The rigid outer frame supports the membrane with a posturally correct 'S' shape and its flexibility allows it to adjust automatically to the profile of your back. The most important function of a task chair is your comfort and well being. Ara's synchronous mechanism delivers a smooth, balanced movement from impressively refined engineering. Designer - Gerard Taylor. Standard features are Height adjustable arms, seat depth adjustment, Black Frame and Base. Choice of seat fabric.